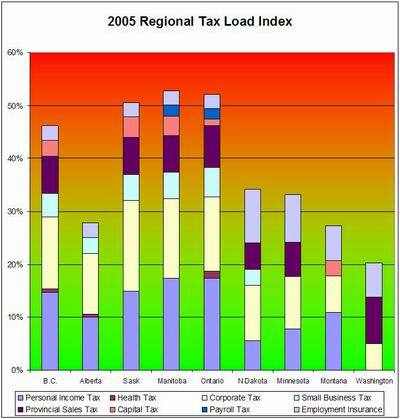 For the past few years the Frontier Centre for Public Policy has prepared a tax load index for the Northern Plains region. This year, the second year in a row with little change in tax rates, the index has been improved to better capture capital taxes and employment insurance tax rates. The Tax Load Index offers a simple measure of tax competitiveness across western Canada and adjacent jurisdictions, including Ontario and four American border states, North Dakota and Minnesota, Montana and Washington. It sums up a jurisdiction’s key tax rates – the top provincial/state marginal rates (including surcharges) on personal and corporate income, healthcare premiums, as well as payroll, capital, and sales taxes – to present a picture of the total tax burden, and to benchmark them against our neighbours’ tax load. The index excludes federal taxes, except employment insurance taxes, which are levied at the state level. For simplicity’s sake, minor variations in how tax bases are calculated have been ignored. Since capital taxes are among the most economically damaging types of taxes, these are calculated using the rate imposed on financial institutions, plus any other capital tax. The index shows little movement since 2002, with little change prior to 2004 and no taxes falling at all this year. With the revised tax load for 2005, Alberta maintains a strong advantage over jurisdictions in Canada and two of four U.S. states in this comparison. Relative to Canadian Jurisdictions, Alberta’s tax load is almost 50 per cent lower. Washington State and Montana are two states in this regional comparison that have lower taxes than Alberta. Washington state has a very low tax burden, with no personal income taxes, and a modest business tax levied on receipts (with a range from 0.11% to 5.03%) while almost ½ of all state tax receipts come from sales taxes. It is the runaway lowest tax jurisdiction of this group and is among the lowest tax jurisdictions in the U.S.
Of the five provinces Saskatchewan and Manitoba don’t charge health premiums. Manitoba has the dubious distinction of having the highest tax load on the chart at 52.78 per cent. While some of its business taxes compare favourably to other provinces it is not the place for entrepreneurial high income earners – it performs worst on the personal tax side with the chart’s highest personal income tax load. It’s also one of the chart’s only two provinces with a payroll tax. The wide tax gap underlies Manitoba’s relative lack of growth and its chronic and increasing dependency on outside transfers like equalization. These figures support recent research by the Atlantic Institute for Market Studies that suggest equalization receiving provinces have strong incentives to have high rates on weak tax bases. Lower rates generate higher revenues in a normal policy environment. Higher rates generate lower revenues which are balanced off with higher subsidies.